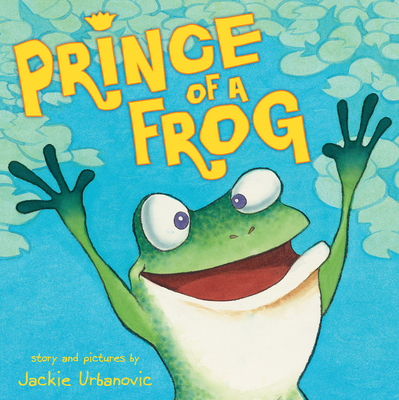 The New York Times bestselling author/illustrator Jackie Urbanovic brings us a cute and clever twist on the classic fairy tale THE FROG PRINCE. Hopper is a frog...a wild frog...a hopelessly hoppy, rambunctious frog that doesn't fit in at the pond. But he can't figure out why. Until one day when a wise turtle suggests that maybe he's not really a frog at all. Maybe he's a prince. So starts Hopper's adventure to find his princess and unlock his true royal self. Will our hero find a princess? And if he does, will his transformation be everything he had hoped for? A hilarious story about finding your true friends and your true self, PRINCE OF A FROG is a triumphant and special read-aloud that brings a new meaning to the term: Happy (Hoppy) Endings! Jackie Urbanovic is the author and illustrator of the Max the duck series which includes two NEW YORK TIMES bestsellers, DUCK AT THE DOOR and DUCK SOUP. She lives in Silver Spring, Maryland, and shares her studio with two playful dogs and one lovable cat. You can visit her online at www.jackieurbanovic.com.